Surprised by the fabulous memorabilia on display. We especially liked seeing all four Beatles' signatures on one scrap of paper. I thought everything was great, but I would suggest that when you check-in that there is more staff before hand. It took us about 45 minutes to check-in. Clean friendly. The main complaint is to far from parking lot. Too many up and down. We had the best time ever! Check in was seamless and rep helped us get exactly the accommodations we needed. Poker room was well-run; Carmine’s and The Buffet were great. I’m planning our next trip - wouldn’t change a thing. Nice but needs updates to rooms....staff was superb....food was excellent! Great experience. Known as the East Coast's gaming capital, this resort destination offers fine dining, legendary entertainment, shopping and beach days all in one spot. Atlantic City blends the ambience of small-town America with lively urban life. The most famous feature of this place is the large boardwalk lined with casinos. Its rich heritage runs deep and continues to attract visitors from around the world looking to uncover the excitement that inspired songs, movie and even board games. The four-mile boardwalk is home to famous casinos and novelty shops. Rest your feet and take a ride in a rolling chair, a boardwalk staple since the 1800s, before meandering in and out of casinos to enjoy the try your luck at the slot machines, roulette wheel, or an old -fashioned card game. The boardwalk overlooks the ocean and one of New Jersey's best beaches. It has earned the nickname “America's playground,” where visitors and locals can tan, swim and play in the sand for free. Just off the boardwalk you will find the Tanger Outlets, which span 15 city blocks. Famous names like Eddie Bauer, Forever 21 and Gap feature in the complex. For more elite shopping, The Pier Shops at Caesars features brands like Tiffany & Co. and Hugo Boss. Atlantic City offers an eclectic array of dining options. Street vendors on the boardwalk serve up pizza, icing -dusted funnel cakes, soft pretzels and other treats. A visit to Steel's Fudge, the oldest family-owned fudge producer in the world, is a necessity for chocolate lovers. Fine dining is available as well. For example, the Borgata Hotel houses Bobby Flay Steak, which features traditional steakhouse fare, and Chef Wolfgang Puck's renowned grille boasts American delights with a twist. To get the most bang for your buck, visit one of the many great AC buffets. Harrah's is a local favorite with its high variety of hot and cold entrees. Famous names present shows around the city, from comedians to popular musical performers such as Rod Stewart, Erasure and Steely Dan. The Convention Center is a mecca for business events and conferences, from automotive trade shows to sports competitions and foodie events. 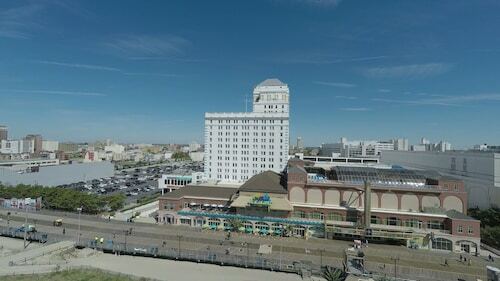 The boardwalk is lined with upscale hotels and most casinos offer rooms with varied amenities. The Borgata is one of the most modern facilities in the marina district, with more than 2,000 luxury guest rooms and suites. Off the main drag, recognized chains are available as well. For instance, the Best Western Envoy Inn is one block from the beach. Its downtown location remains in the heart of the city but provides more affordable rates. 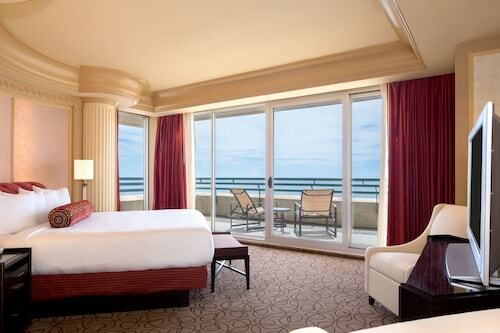 Atlantic City hotels vary in price. Usually, boardwalk properties run a few hundred dollars a night. Further away, a visitor may find a suitable room for less than $100. During peak summer season, rates tend to be rise considerably. Beach lovers will want to visit any time from June through August. However, this is peak season, so hotel rates are high. Atlantic City is located in the southern part of New Jersey, meaning summers are warm and humid but receive a pleasant ocean breeze, which keeps temperatures cooler than inland. Average highs are in the mid-70s. To avoid crowds, fall and spring are better and, after Labor Day, airfares drop, but some attractions begin to close. Winters are cool, but Atlantic City’s position keeps it from receiving as much snow as other New Jersey regions, averaging 16 inches per year. In March, the Convention Center houses the largest indoor antique and collectibles show in the world. Mid-June, sees the Borgata host its "Summer Open" poker tournament for budding players. For fall, a new event in development is the AC Seafood Festival. This gives attendees the chance to experience live music, art and top food prepared by local chefs. The AC International Triathlon occurs in September as well, so you can run, cycle and swim your way to victory, or simply sit back and watch the competition. Its near restaurants, outlets and pier. The casino is great.